Home » Hosting Limits » Free WordPress Hosting: What Do You Lose? Free WordPress Hosting: What Do You Lose? Does free web hosting exist? Yes, it does. Does free GOOD hosting exist? Well, that depends on what you mean by “good”, but in general – no. With each type of free hosting service, you lose different things. Whether you’re looking to host free HTML pages or WordPress, here’s a list of what you don’t get. P.S. If you’re looking for the cheapest web hosting, as opposed to “free” web hosting, you can get started by comparing the prices here. Here’s a complete list of what you get and what you don’t with GoDaddy 1 dollar a month hosting. Beware – it sounds cheap, but it’s not! Anyone can get started with free WordPress hosting at www.wordpress.com. Just sign up for an account, select a name for your blog and you’re good to go! The disadvantage, you don’t get your own URL. If you want, you can link an existing domain name to your WordPress blog, but they charge you a fee. It’s no longer free. If you want to start a personal blog, this might not be a problem. I myself started on blogger.com years ago! But you won’t be taken seriously by anyone. No matter how good your content is, no one looks at a subdomain site and points to it as an authority! This is the opposite of a “self-hosted” WordPress blog from wordpress.org. Managed free WordPress severely restricts what you can do. You have a limited choice of themes to choose from, you’re limited in how much you can customize them with CSS, you can’t install plugins or change code. Basically, you’re prohibited from doing all the fun stuff that makes WordPress awesome in the first place. If you want TRUE WordPress web hosting for free, you have to aim for Option 2. But of course, there’s a catch. How can there not be? Each company will have a different catch, but here’s an idea of what you’ll face. On the face of it, 000webhost.com offers you a great deal. A free one in fact! You won’t be asked to pay a single dollar for web hosting, and you get your own space on a shared server. You can even add your own domain name for free! Website “Sleeps” For 1 hr Every Day! When you sign up with 000webhost, your website will be unavailable for 1 hr each day. You can choose which hour of the day that will be. But if you’re at all serious about building a website, this is a complete dealbreaker. It’s not easy to find this limitation, but it’s there. To me, it’s crippling. Fortunately, the parent company Hostinger has some of the cheapest web hosting plans on the web. You can get started with as little as $2.39/month. So you can begin with a free hosting plan with 000webhost, and then seamlessly move to Hostinger. It’s great for setting up your site, verifying that everything’s working, and then moving to Hostinger when you want it to go live. You can essentially do all your development work for free without paying a cent for hosting! freehosting.com Review: What Are the Limitations? The second major company to provide free web hosting is freehost.com. Unlike 000webhost.com, I don’t see any major “breaking” features. However, your sites will be SLOW. Not only that, there are plenty of complaints about the uptime of the servers. 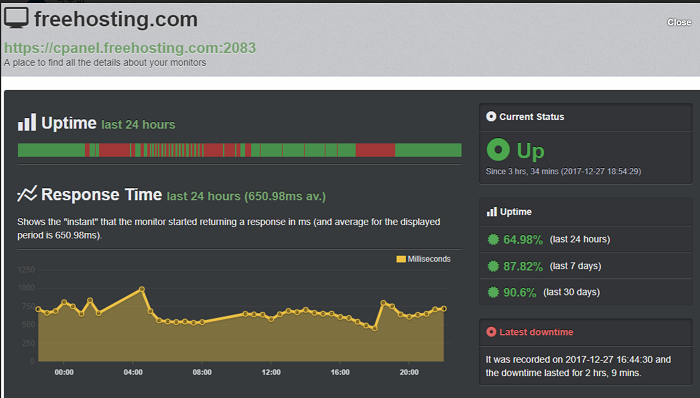 Here’s a sample screenshot showing only a 65% uptime in the past 24 hours. Many hosting providers like SiteGround, DreamHost and InMotion provide free SSL certificates for your site. This is particularly important now that Google enforces HTTPS strictly in the Chrome browser and also gives a ranking boost to secure sites. Unfortunately, freehosting.com doesn’t give you an SSL for free. You can purchase one – but that’s…not free anymore! Of course, you can make any site use HTTPS via Cloudflare – here’s a tutorial on how to do just that. But it might not be something you want to do. The slow response times alone are enough to turn customers away. If you’re dead set on getting free WordPress hosting, then it’s definitely possible. Either with a managed solution like wordpress.com or with free hosting as mentioned above. But each has its own cons. The former is fast but limited. The latter is unlimited but sloooooooow and unreliable. Instead, if you’re serious about hosting your website, you can start by comparing the cheapest WordPress hosting deals side by side. Trust me – when it comes to web hosting, you get what you pay for.